ORLANDO, Fla., April 2, 2019 — Nature has evolved protein-based substances with mechanical properties that rival even the best synthetic materials. For example, pound for pound, spider silk is stronger and tougher than steel. But unlike steel, the natural fiber cannot be mass-produced. Today, scientists report a new method that takes advantage of engineered bacteria to produce spider silk and other difficult-to-make proteins that could be useful during future space missions. If produced in sufficient quantities, spider silk could be used for a variety of applications, ranging from bullet-proof fabric to surgical sutures. But spider silk isn’t easy to farm — spiders produce tiny quantities, and some species turn cannibalistic when kept in groups. Therefore, scientists have tried engineering bacteria, yeast, plants and even goats to produce spider silk, but they haven’t yet been able to fully replicate the natural fiber’s mechanical properties. Part of the problem is that spider silk proteins are encoded by very long, highly repetitive sequences of DNA. Spiders have evolved ways to keep these sequences in their genome. But when scientists put this type of DNA into other organisms, the genes are very unstable, often getting snipped or otherwise altered by the host’s cellular machinery. Zhang and colleagues at Washington University in St. Louis wondered if they could break the long, repetitive sequences into shorter blocks that bacteria could handle and make into proteins. Then, the researchers could assemble the shorter proteins into the longer spider silk fiber. The team introduced genes to bacteria that encoded two pieces of the spider silk protein, each flanked by a sequence called a split intein. Split inteins are naturally occurring protein sequences with enzymatic activity: Two split inteins on different protein fragments can join and then cut themselves out to yield an intact protein. After introducing the genes, the researchers broke open the bacteria and purified the short pieces of spider silk protein. Mixing the fragments caused them to join together through the “glue” of the split intein sequence, which then cut itself out to yield the full-length protein. 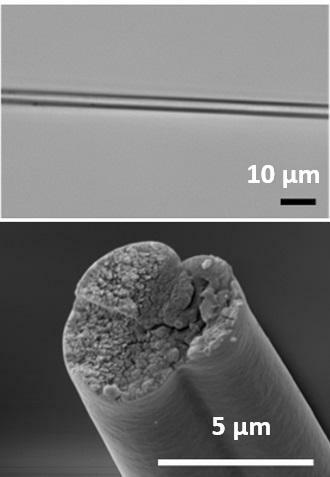 When spun into fibers, the microbially produced spider silk had all of the properties of natural spider silk, including exceptional strength, toughness and stretchability. The researchers obtained more silk with this method than they could from spiders (as much as two grams of silk per liter of bacterial culture), and they are currently trying to increase the yield even more. The researchers can make various repetitive proteins simply by swapping out the spider silk DNA and putting other sequences into bacteria. For example, the researchers used the technique to make a protein from mussels that adheres strongly to surfaces. The protein could someday be applied as an underwater adhesive. Now, the researchers are working on streamlining the process so that the protein-joining reaction can occur inside bacterial cells. This would improve the efficiency and potential automation of the system because researchers wouldn’t have to purify the two pieces of the protein and then incubate them together. The researchers acknowledge support and funding from NASA, the Air Force Office of Scientific Research and the Office of Naval Research. Future space exploration will demand the development of highly efficient technologies to recycle readily available resources (e.g. in situ resource utilization, ISRU) for the sustainable production of indispensable supplies. Recent development in synthetic biology has enabled controllable cellular behavior and novel metabolic functionalities, enabling engineered cells to perform naturally-unachievable tasks. We aim to use synthetic biology methodologies to develop bacteria-based platforms that enable ISRU and produce high-performance, protein-based materials, such as spider silks. We have developed strategies that allow us to synthesize ultra-high molecular weight spidroins (556 kDa) at gram per liter scales. Fibers spun from our microbially produced spidroin fully replicate the mechanical performance of natural spider silk by all common metrics, i.e. tensile strength (1.03 ± 0.11 GPa), modulus (13.7 ± 3.0 GPa), extensibility (18 ± 6%), and toughness (114 ± 51 MJ/m3). The developed strategy reveals a path that can be potentially exploited for future extraterrestrial production of various high-performance, protein-based materials for mechanically-demanding applications.